A recurring item on the Gastronomixs blog: the must-reads in culinary literature! Books on culinary themes and cookery books are a source of inspiration, whether culinary literary classics or new books hot off the press. The recipes printed in cookery books can be used to master a technique, try out a flavour combination, or discover a new way to prepare a familiar ingredient. But above all, the most enjoyable aspect is coming up with new takes on existing recipes. 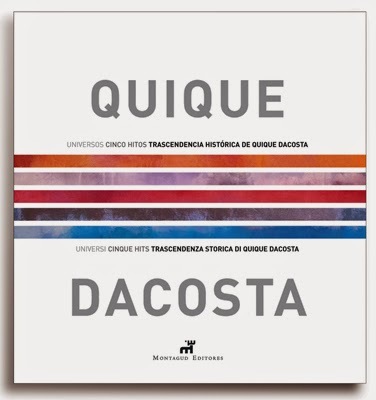 Through his self-titled book, this month's guest chef, Quique Dacosta***, gives us a glimpse into his world and evolution, based on the three pillars of knowledge, culinary ecosystems, and research. He looks back at his cuisine over a period from 2000 to 2006, and reflects on his developments and discoveries. The book contains more than 90 dishes from this period, accompanied by beautiful photography. It is part of a multimedia project, which also includes a website called Quique Dacosta's Universe. By purchasing the book, you will also be able to access the site. Although you can also visit the site without purchasing the book, you will only be able to see a selection of previews. This book is a definite must-have for your bookcase; not only does it look good, you can also learn a lot from it! Click here to see the three compositions he shares with us this month.